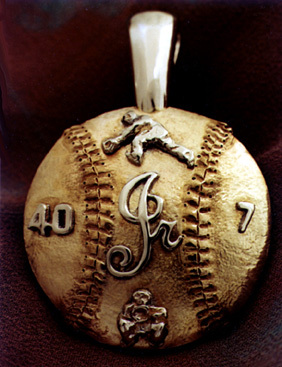 The customer requested a pendant for a ballplayer, using the "numbers " 40 and 7... and "Jr" with perhaps a "catcher" figure. 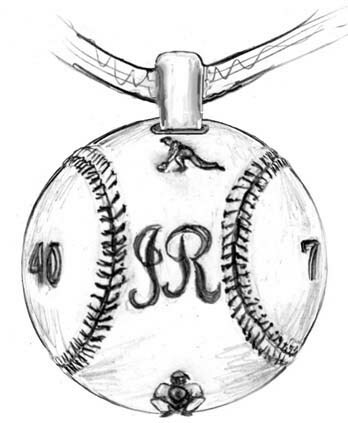 After thinking about this design, we decided that a realistic baseball, and an additional figure would balance this piece out very nicely. We did a preliminary sketch and sent it to the customer for approval. With a few minor changes of the rendering at the request of the customer, (enlarging the bail, making the "JR" a "Jr", and creating a bolder look), we proceeded to build the waxup. After consulting with the customer, we decided on using 14K white gold for the bail and other small elements of the design. These were sculpted separately from the 14K yellow gold "baseball" background. After texturing and polishing, the pieces were assembled together to create this unique pendant.